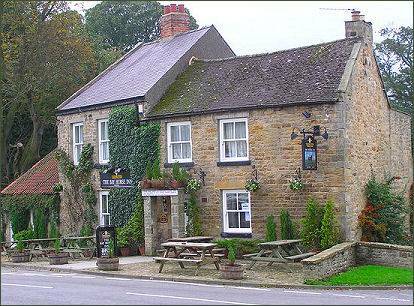 The pretty village of Ravensworth nestles in the Holmedale Valley in North Yorkshire. It is situated around 4.5 miles (7.2 km) to the north-west of the town of Richmond. Ravensworth has ancient origins dating back to the time of Viking settlement, the village derives its name from the Old Norse word Hrafn, meaning raven. Originally it was known as Ravenswath, the word "wath" was Old Norse and meant "ford", literally the ford of Raven. Its name and spelling has changed over the centuries, in the eleventh century it was known as Raveneswet, Rasueswaht in the twelfth century, and Ravenswath from the thirteenth to the sixteenth century, before finally evolving into Ravensworth. The village is mentioned in the Domesday Book of 1086. The Lord of the Manor in 1066 was one Thorfin. Its recorded annual value was £1.5, only slightly reduced from the £2 of 1066 prior to the William the Conqueror's savage 'Harrying of the North'. Following the Norman conquest, Alan Rufus, 1st Lord of Richmond, allocated the lands to his relative Bodin of Middleham, who was possibly an illegitimate son of Odo, Count of Penthièvre, who was a close relative and important ally of William the Conqueror. Bodin later relinquished his lands in order to become a monk, and the estate passed to his brother, Bardolph, from whom the FitzHugh line is descended. 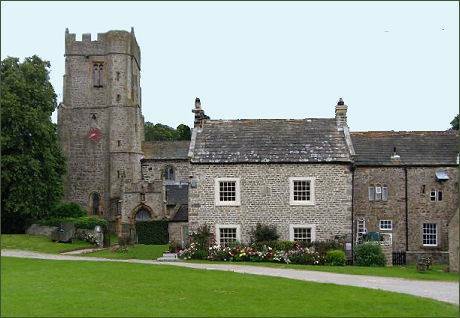 Bardolph's son, Akarius Fitz Bardolph, granted land at Fors in Wharfedale for the founding of a monastery in 1145. He died in 1161 and in 1165 his son, Harveus fitz Akarius, consented to the abbey being relocated to its permanent site at Jervaulx Abbey. The antiquarian John Leland described Ravensworth as a "pretty" village, while Pevsner described it as "perfect and exceptional". The astronomer William Lax was born in the village in 1761, producing a method of finding the latitude by means of two altitudes of the sun there in 1799. Sir Walter Scott referenced the village in his epic poem "Rokeby". Written in 1813, the poem is set in Teesdale during the Civil War. A number of skirmishes took place in the area during the Civil War, and the region was a stronghold.of the Royalists. A number of listed buildings surround the pretty village green, most of which date back to the eighteenth century. The village also contains the remains of fourteenth century Ravensworth Castle, the ancestral home of the FitzHugh family. 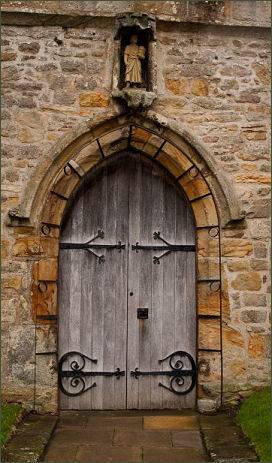 The medieval village church of Church of St Peter & St Felix in Kirby Hill, a Grade I listed building, is situated about a mile (1.6 km) from Ravensworth. The building dates back to 1397 and is thought to occupy the site of a much earlier Saxon church. An interesting feature of the church is a lepers squint. A memorial in the church commemorates the former rector Dr John Dakyn, who took part in, and is a noted chronicler of the Pilgrimage of Grace, a northern rising against Henry VIII's religious reforms. In 1556 he established the Kirby Ravensworth Free Grammar School and an almshouse. A trust in his name still allocates educational grants to local youngsters. The church is also notable as the resting place of the last male descendant of the reformer John Wycliffe. The village pub, the Bay Horse Inn (pictured above left) is an attractive building with its mellow stone walls cobbled front patio and colourful hanging baskets. The pub has a wide selection of delicious food including a vegetarian menu. Ravensworth is best known as the home of the former international cricketer Ian Botham. 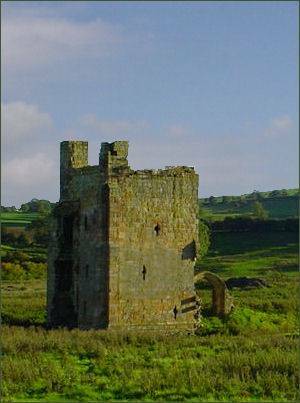 A fortress was built at Ravensworth during the reign of King Henry II (1133 - 1189), which was the ancestral home of the Fitzhugh family, who purchased the land from Marrick Priory. King John was entertained there in 1201. The castle was a simple rectangular enclosure protected by a substantial curtain wall and a moat. Towers stood on the south-east and south-west corners whilst a square, three storey gatehouse dominated the northern side. The Fitzhughs were appointed barons by King Edward II on 15 May 1321. Henry FitzHugh, 3rd Baron FitzHugh, Lord Chamberlain of the Household to Henry V, built Ravensworth Castle in 1391 on the site of a previous fortress dating from the eleventh century. King Richard II granted Henry FitzHugh a licence to enclose the 200 acre park around his estate at Ravensworth. Henry remained closely associated with the Crown even after the usurpation of the House of Lancaster, he fought against the Scots in the Battle of Humbleton Hill in 1402 and negotiated the surrender of his uncle, Archbishop of York Richard le Scrope, in 1405. He also served under Henry V in his French campaigns, and fought at the Battle of Agincourt in 1415. Henry later escorted the king's remains back to England following his death from dysentry in 1422. Ralph de Greystoke, 3rd Baron Greystoke, was born in the castle, home of his uncle Henry, Lord Fitzhugh, on 18 October 1353. Following the extinction of the Fitzhugh male line with the death of George, 7th Baron FitzHugh in 1513, ownership of the castle and estate was passed through the female line to his cousin Sir Thomas Parr, father of Henry VIII's sixth wife, Catherine Parr. Following his death, it passed to his son, William Parr, 1st Marquess of Northampton by which time it was ruined, largely as a result of being quarried for local building materials. It passed to the Crown Estate in 1571 after Parr died without issue. The castle began to be pulled down in the middle of the sixteenth century, shortly after the visitation by the antiquarian John Leland, however almost the entirety of the gatehouse remains intact. In 1629 the estate was conferred from the Crown to Edward Ditchfield. In 1633 it was sold to the Robinson family, who later sold it to Thomas Wharton, 1st Marquess of Wharton in 1676. It then passed to Wharton's son Philip Wharton, 1st Duke of Wharton, before passing through his sister to Robert Byerley. By 1779 the estate belonged to the Legard Baronet.